Motivated by the DARPA Robotics Challenge (DRC), the application of operator assisted (semi-)autonomous robots with highly complex locomotion and manipulation abilities is considered for solving complex tasks in potentially unknown and unstructured environments. Because of the limited a priori knowledge about the state of the environment and tasks needed to achieve a complex mission, a sufficiently complete a priori design of high level robot behaviors is not possible. Most of the situational knowledge required for such behavior design is gathered only during runtime and needs to be interpreted by a human operator. However, current behavior control approaches only allow for very limited adaptation at runtime and no flexible operator interaction. In this paper an approach for definition and execution of complex robot behaviors based on hierarchical state machines is presented, allowing to flexibly change the structure of behaviors on the fly during runtime through assistance of a remote operator. 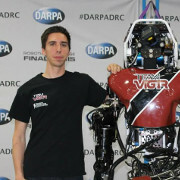 The efficiency of the proposed approach is demonstrated and evaluated not only in an example scenario, but also by application in two robot competitions. Sergio Garcia, Daniel Strüber, Davide Brugali, Alessandro Di Fava, Philipp Schillinger, Patrizio Pelliccione, Thorsten Berger, "Variability Modeling of Service Robots: Experiences and Challenges", 13th International Workshop on Variability Modelling of Software-Intensive Systems, Leuven, February 2019. Henning Schlüter, Philipp Schillinger, Mathias Bürger, "On the Design of Penalty Structures for Minimum-Violation LTL Motion Planning", IEEE Conference on Decision and Control (CDC), Miami, December 2018. Philipp Schillinger, Mathias Bürger, Dimos V. Dimarogonas, "Improving Multi-Robot Behavior Using Learning-Based Receding Horizon Task Allocation", Robotics: Science and Systems (RSS), Pittsburgh, June 2018. Philipp Schillinger, Mathias Bürger, Dimos V. Dimarogonas, "Auctioning over Probabilistic Options for Temporal Logic-Based Multi-Robot Cooperation under Uncertainty", IEEE International Conference on Robotics and Automation (ICRA), Brisbane, May 2018. David C. Conner, Stefan Kohlbrecher, Philipp Schillinger, Alberto Romay, Alexander Stumpf, Spyros Maniatopoulos, Hadas Kress-Gazit, Oskar von Stryk “Collaborative Autonomy Between High-Level Behaviors and Human Operators for Control of Complex Tasks with Different Humanoid Robots”, The DARPA Robotics Challenge Finals: Humanoid Robots To The Rescue, pp. 429-494, Springer, Cham, April 2018. 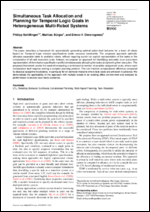 Philipp Schillinger, Mathias Bürger, Dimos V. Dimarogonas, "Simultaneous Task Allocation and Planning for Temporal Logic Goals in Heterogeneous Multi-Robot Systems", The International Journal of Robotics Research (IJRR), 2018. Philipp Schillinger, “Specification Decomposition and Formal Behavior Generation in Multi-Robot Systems”, Licentiate Thesis, KTH Royal Institute of Technology Stockholm, 2017. Philipp Schillinger, Mathias Bürger, Dimos V. Dimarogonas, “Simultaneous Task Allocation and Planning”, The What without the How (Workshop), Robotics: Science and Systems (RSS), Cambridge, July 2017. Philipp Schillinger, Mathias Bürger, Dimos V. Dimarogonas, "Multi-Objective Search for Optimal Multi-Robot Planning with Finite LTL Specifications and Resource Constraints", IEEE International Conference on Robotics and Automation (ICRA), Singapore, May 2017. Philipp Schillinger, Mathias Bürger, Dimos V. Dimarogonas, “Specification Decomposition and Formal Behavior Generation in Multi-Robot Systems”, Lucia PhD School on Artificial Intelligence and Robotics, Örebro, December 2016. 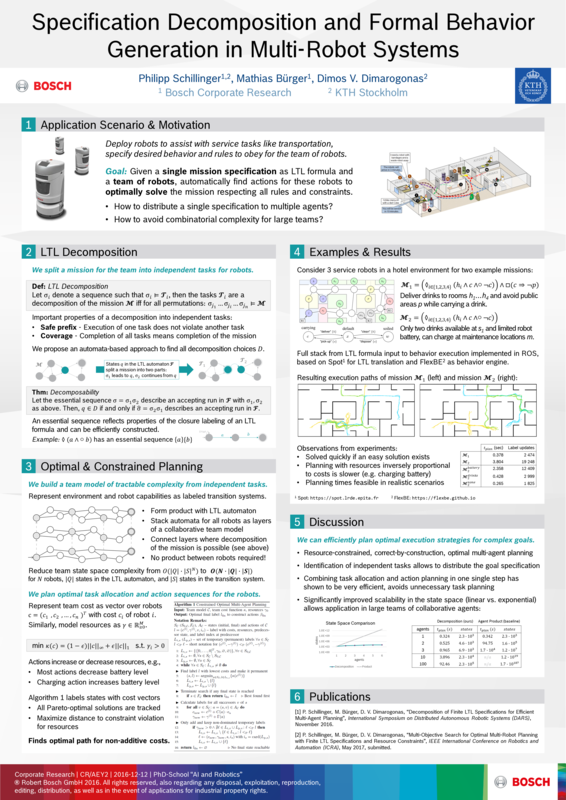 Philipp Schillinger, Mathias Bürger, Dimos V. Dimarogonas, “Decomposition of Finite LTL Specifications for Efficient Multi-Agent Planning”, International Symposium on Distributed Autonomous Robotic Systems (DARS), London, November 2016. Alberto Romay, Stefan Kohlbrecher, Alexander Stumpf, Oskar von Stryk, Spyros Maniatopoulos, Hadas Kress-Gazit, Philipp Schillinger, David C. Conner, “Collaborative Autonomy between High‐level Behaviors and Human Operators for Remote Manipulation Tasks using Different Humanoid Robots”, Journal of Field Robotics, September 2016. Stefan Kohlbrecher, Alexander Stumpf, Alberto Romay, Philipp Schillinger, Oskar von Stryk, David C. Conner, “A Comprehensive Software Framework for Complex Locomotion and Manipulation Tasks Applicable to Different Types of Humanoid Robots”, Frontiers in Robotics and AI, June 2016. Spyros Maniatopoulos, Philipp Schillinger, Vitchyr Pong, David C. Conner, Hadas Kress-Gazit, “Reactive high-level behavior synthesis for an Atlas humanoid robot”, IEEE International Conference on Robotics and Automation (ICRA), Stockholm, May 2016. Stefan Kohlbrecher, Alberto Romay, Alexander Stumpf, Achim Stein, Oskar von Stryk, Philipp Schillinger, Spyros Maniatopoulos, Hadas Kress-Gazit, David C. Conner, “An Introduction to Team ViGIR's Open Source Software and DRC Post Mortem”, ROSCon, Hamburg, October 2015. 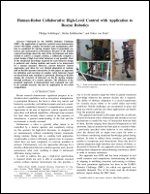 Philipp Schillinger, “An Approach for Runtime-Modifiable Behavior Control of Humanoid Rescue Robots”, Master Thesis, Technische Universität Darmstadt, 2015. Andreas Braun, Tim Dutz, Michael Alekseew, Philipp Schillinger, Alexander Marinc, “Marker-Free Indoor Localization and Tracking of Multiple Users in Smart Environments Using a Camera-Based Approach”, International Conference on Distributed, Ambient, and Pervasive Interactions (DAPI), July 2013. Philipp Schillinger, “Development of an Operator Centric Behavior Control Approach for a Humanoid Robot”, Bachelor Thesis, Technische Universität Darmstadt, 2013.